First a litter flattery. May I say that I am a sincere fan of your work on screen and with UNICEF. Thank you for your diligent, wonderful work in both. While globetrotting in the U.S. Air Force (I am retired Air Force now) I visited many places in the world seeing first hand the beauty and the tragedy of our world. I greatly admire your work with UNICEF. I must say that during those travels I wore out a few VHS copies of your Bond films, I loved them. And yes, I did “swoon” at your suave ways! (I loved your British Post Office commercial!) I thank you for getting me through some lonely days on the road (smile). Thank you for producing such wonderful entertainment and escape. I am a sincere, devoted fan who follows you still and look forward to seeing your current picture. My question is, given your film career lifestyle on the road, your current work with UNICEF and several residences, do you have time for pets? Dogs, cats, or maybe birds or fish? I never managed to have one until I retired from the Air Force; now I have a wonderful dog who is my constant companion. Alas, you almost answer your question for me. No, I’m afraid due to our constant travelling around the world we do not have any pets. I think it would be terribly unfair on any animal to not know if they are coming or going. I used to have a dog in the 70s when I lived at Denham and the children were young, but once we moved abroad life became a little more hectic. One of our New Years Day ‘traditions/habits’ is trying to spot you in the audience at the New Years Day concert in Vienna on TV! We didn’t see you this year and I subsequently gather you were not there, you may not be aware of this but most years the director/cameraman likes to focus on you and the people around you for a few seconds… you might be missing out on some royalty fees! My question is, we haven’t heard much regarding the new Saint TV pilot lately, can I ask how is it progressing? I saw a poster in 2008 on the excellent www.saint.org website for the proposed James Purefoy remake and I was very excited that it was really happening! But it all seems to have gone quiet recently on the Dougray Scott version, are there any snippets of information you can tell us? I really hope it goes ahead and gives the other TV shows a run for their money! It’s actually very difficult to get tickets for that concert, and there is a process whereby if you succeed you cannot go the next year in order to give someone else the chance. Hello again and thanks for answering my Persuaders question a few months back. I hope you and your lovely wife are still enjoying the Taittingers every chance you get. A bottle of that or Moet along with a couple episodes of The Persuaders is such a lovely way to spend an evening. Congratulations on your new film, which as I write this I believe you have just started filming in Bucharest. I’ll very much look forward to seeing it. As mentioned above, I still enjoy watching you and Tony in the Persuaders on DVD every weekend, but my question this time is about a film you did with another Tony(Perkins) called ffolkes aka North Sea Hijack. I very much enjoyed it, and just wondered if you had any specific recollations of working on this film and/or working with Mr. Perkins? He was always so good at being “the bad guy”. The cat angle was different and interesting, and I loved your portrayal of the Rufus Excalibur ffolkes character. Seems like you had a lot of fun playing against type on this one. Thanks in advance for your reply Sir Roger and I hope you’re enjoying yourself working on your latest film. 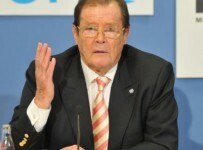 See you again soon in The Persuaders, and it’s been a pleasure speaking with you here. ffolkes is one of my favourite characters, as he is a total sexist and always speaks his mind. It was a treat to play someone like that – totally against type. I didn’t share that much time with Anthony Perkins – just a few scenes. He was a very quiet, calm man. I didn’t really get to know him that well. Most of my scenes were with James Mason, who was a delight. He was always very concerned we didn’t harm any of the cats on set – more concerned than how the other actors were treated in fact! My latest film in Bucharest was fun, though on the penultimate day I tripped over a cable on the dark stage and three burly electricians fell on top of me. I sprained my ankle badly – so if you see me hobbling in the coming weeks, you’ll know why. Thanks so much for your kind reply, I enjoyed your anecdote about carpooling to work with Dean Martin while filming “The Cannonball Run” immensely. There are so many anecdotes from The Persuaders set. Too many really. There is a blu-ray release of the series this September to tie in with the 40th anniversary and, I believe, a book on the show – so hopefully that’ll keep you occupied with stories for a while. First of all, thank you for giving me the opportunity to write to you! I want to ask if you have any role model from which you have learnt and become the person you are? For me, my mother is the first and all people that have sacrificed something for those who are in need! “If you judge people, you have no time to love them. Thank you for being representative for UNICEF and especially for the children! Give my regards to your lovely wife Lady Kristina! (especially since she is Swedish like I am). Of course my parents had a huge influence on me and my life. They taught me right from wrong, and how not to be selfish. That was something I saw in Audrey Hepburn too – total unselfishness. I have spoken and written so much of Audrey. She introduced me to UNICEF and she really opened my eyes to the important things in the world. Dear Sir Roger, my question for this month is not doubt, about Elizabeth Taylor the great actress that dead recently, whom you shared in the movie “The Last Time I Saw Paris” (1954) and were very close friend of you. Which are your memories about this fantastic actress? Thanks a lot. Rest in peace for the lady of the violet eyes (by the way, a Colombian journalist said that the tragedy was that Mrs. Taylor had to close her eyes). HAving worked with Liz I also knew her personally from being neighbours in Gstaad, when she was married to Richard Burton. We often socialised. She was a great, fun person to be around and I remember telling her I was off to shoot a film called Shout At The Devil with Lee Marvin. “Lee Marvin?” she asked. “Oh Roger, be careful, he was the one who turned my Richard to drink”. Stunning quality box canvas of Sir Roger Moore only from this website. In vivid colour will make an impressive showpiece. Only the very best materials have been used with solid 1.5 inch non-warping stretcher bar frame, and non-fade 100 year UV screening guaranteed inks. UK free postage and packing to UK .